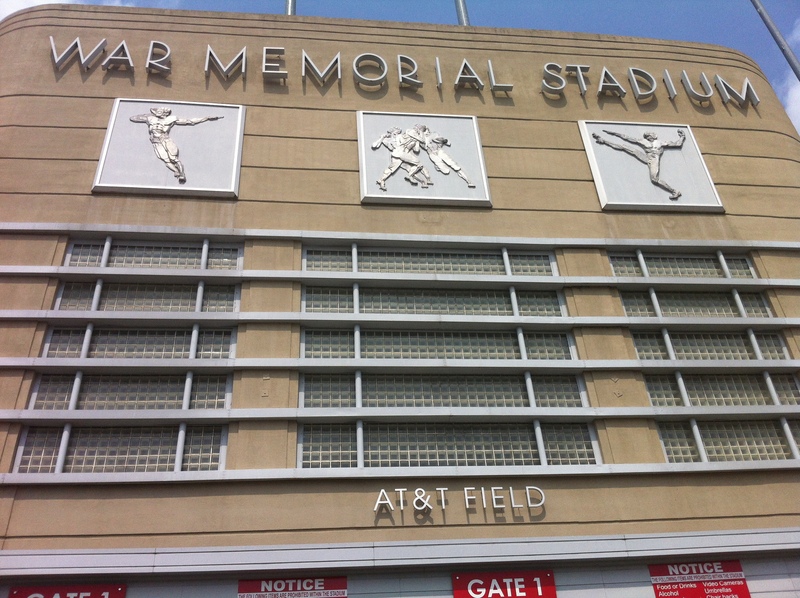 Today’s architeaser is the main entrance on the eastern side of War Memorial Stadium. It is one of the few parts of the stadium that closely resembles what was built and dedicated in 1948. The stadium was designed by architect Bruce R. Anderson and was constructed for a cost of $1.2 million. The original seating capacity of 31,075 was expanded in 1967 and 2010. It is now more than 54,000. The three panels depict football players. The one on the left depicts a player (ostensibly a quarterback) throwing a football. The middle panel shows two defensive players running into a rusher. The third panel shows a kicker after having punted a ball. War Memorial Stadium is owned by the State of Arkansas and administered by the War Memorial Stadium Commission. Today’s architeaser features two friezes from the old Arkansas Game and Fish Commission Building behind (to the west) of the Arkansas State Capitol. Originally built to house the Game and Fish Commission offices, the building has been subsumed by the One Capitol Mall complex (aka Big Mac). The Game and Fish Commission offices are now out in west Little Rock near I-430. 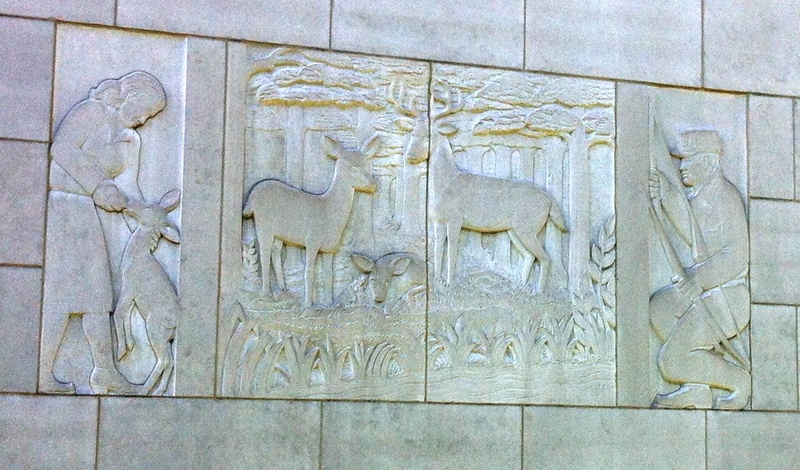 One frieze depicts a woman feeding a deer, a family of deer, and a bow hunter. The other frieze depicts a modern fisherman with rod and reel and an 19th century boy sitting along a river bank with a cane pole. 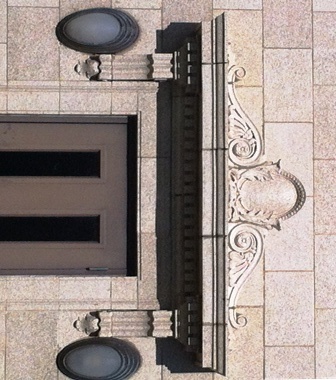 Today’s Architeaser is one of a series of decorative panels above the doors of the old Department of Education Building to the west of the Arkansas State Capitol. Across the front facade of this rather utiltarian WPA era structure, there are several of these panels each containng 8 fleur de lis. While one could suppose that they are a tribute to the French heritage of both Arkansas and Little Rock, there do not appear to be records to confirm this. The building still contains offices of the Arkansas Department of Education. But today, the offices have also expanded to a nearby building. These two adjoining buildings are now linked and the entire complex is known as the Arch Ford Education Building. 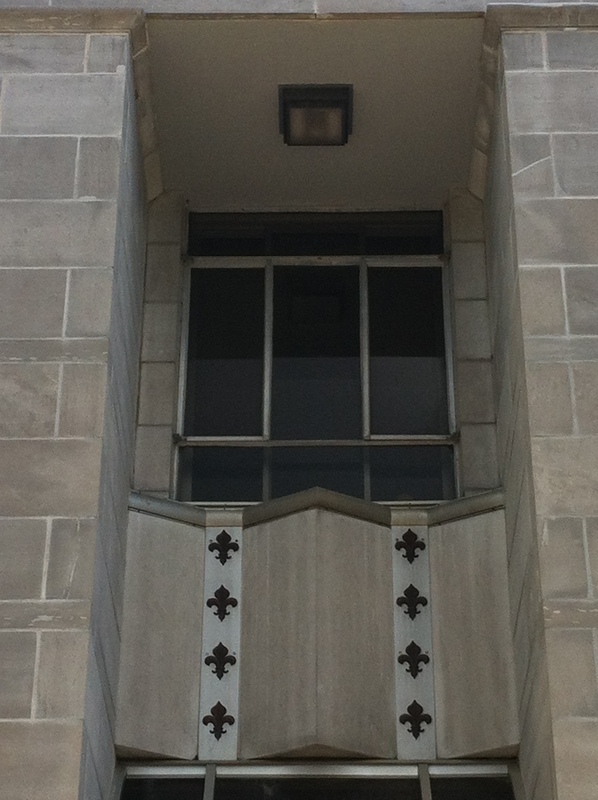 Today’s Architeaser features the unique lights on the west side of the Capitol Hill building. In the 1960s the state purchased a building known as “The Rackensack Apartments,” north of the Capitol building, backing up to 3rd Street. Built in the 1920s, the structure, now called Capitol Hill, continues to provide legislators’ housing and overflow office space. The lobby is a popular place for receptions and meals for legislators. 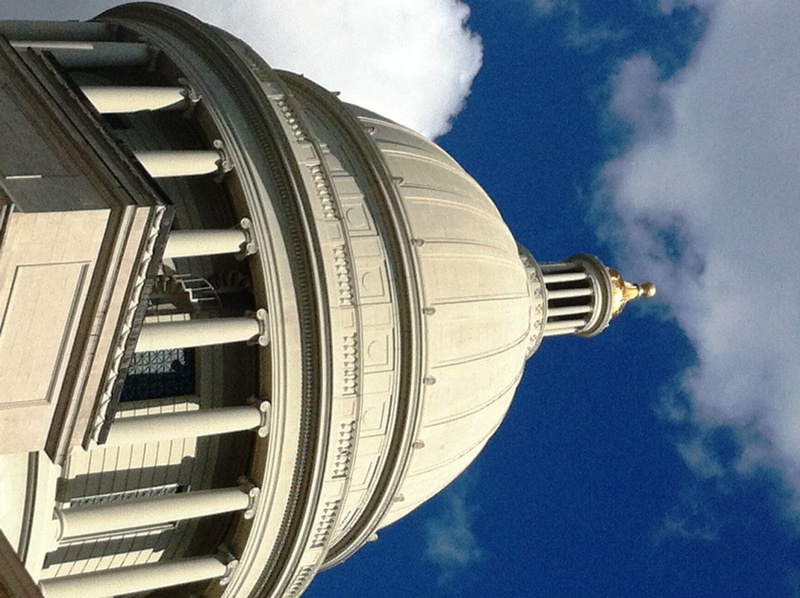 The dome of the Arkansas State Capitol Building is generally thought to be smooth – but as this photo shows, there are quite a few flourishes and architectural touches on the dome. Built over 16 years (from 1899 to 1915) it had two architects of record (George R. Mann and Cass Gilbert) and was both championed and reviled by various Arkansas governors during the design and construction. The cornerstone was laid on November 27, 1900. Since this was to be a “pay as you go” project, that slowed progress considerably. When completed, it measured 440 feet along its north-south axis, and just over 195 feet from east to west. From the ground to the top of the dome is 213 feet. The building has nearly 287,000 square feet of offices. The majority of the exterior of the Capitol is made of Batesville limestone. The curved portions of the dome, however, are made of softer Indiana limestone. Total construction cost was $2.2 million with today’s value of the building being $320 million. The cupola is covered in 24 karat gold leaf. Tomorrow there will be a lecture on the construction of the building. More information on this will be in another entry. In April 2001, a 49,000 square foot addition was made to the Justice Building on the State Capitol grounds. This addition, formally called the Justice Building West Wing, actually created a new entrance to the building and changed the look of the facility. Built in the neo-classical style, it cost $7.6 million. It houses offices for the justices of the Arkansas Supreme Court, the clerk’s offices as well as other offices for attorney services. 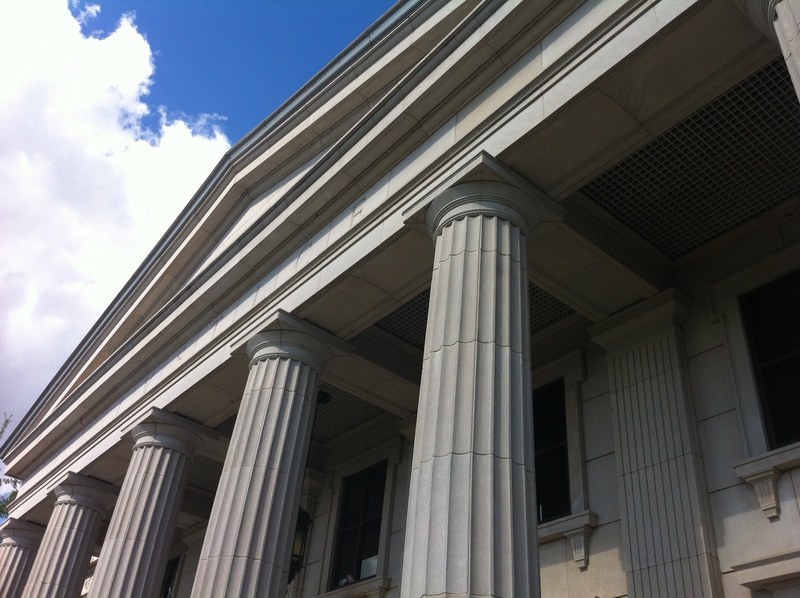 The front of the building is flanked by a series of ionic, fluted columns, which are pictured above.